A tribute to Heiner Friedrich, art dealer, collector, promoter, patron, and Museum founder, on the occasion of his 80th birthday. 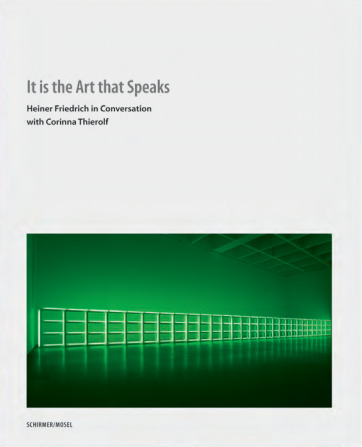 A richly illustrated conversation, he talks about his activities of 60 years to promote artists such as Donald Judd, Joseph Beuys, Dan Flavin, Gerhard Richter, Walter De Maria, Georg Baselitz, Andy Warhol, Sigmar Polke, and Cy Twombly in Europe and the USA. Schirmer/Mosel. With contributions by Herzog Franz von Bayern, Michael Govan and Elisa Schaar. Size: 24 x 28 cm, 112 pages, 113 colour plates, hardcover. English edition.